How do you assess individual muscle strength? This post is referring to individual muscle strength rather than whole body strength or even functional measures of strength (groups of muscles involved in performing a specific function). There are many ways to measure individual muscle strength. Each method has their own strengths and weaknesses 🙂 They fall into 4 basic categories: a) Manual muscle strength testing; b) isokinetic testing; c) gauges and; d) hybrid testing. Which method do you use? A) Manual muscle strength testing – This method involves the patient being placed in a very specific position and asked to resist against the examiners push. The examiner then puts pressure against the limb with their hand and gauges how much pressure they can exert before they overcome the patient’s resistance. This type of test is basically a 1 rep max resistance. Quantity of muscles – You can measure a large number of muscles in the legs, arms and some in the trunk. Over 100 muscles can be isolated using this technique, each with many variations. Speed – This testing can be done very quickly, one test every 10-15 seconds. Cost – This method is very inexpensive, basically the only expense is the examiners time. Accuracy – Results are semi-quantitative. You can estimate strength on a scale of 0-5 or 1-100%. Inter-examiner reliability is moderate to low. Full range – Tests can only be applied to one specific arc of the muscles range of motion at a time. You can test the same muscle in multiple different arcs of the muscle’s range of motion to approximate strength throughout the full range of motion, but with a corresponding increase in testing time. Applications for this type of testing includes: screenings, repeat testings by the same therapist or when testing is needed on muscles that are smaller or are difficult to measure with machines. B) Isokinetic – Pros: This type of testing uses machines that measure strength exerted across a broader arc of the muscles range of motion. The accuracy, inter and intra examiner reliability is very good. Cons: On the downside, the equipment is fairly expensive, time consuming to set up for each test and can only be performed on a limited number of muscles. C) Gauges– There are cable tensiometers, pinch gauges, dynamometers and various other devices which can measure muscle strength. These are frequently used as 1 rep max exertion tests. Pros: because the examiner is not estimating strength or directly involved in the measurement process, accuracy is improved significantly. These devices tend to be less expensive than the isokinetic machines. Cons: Each testing device has a limited number of muscles that can be tested so multiple machines are needed. Even so, there are many muscles that can be tested manually that are not available with any machine method. Since these are isometric tests, each procedure measures a relatively small arc of the muscle’s range of motion. 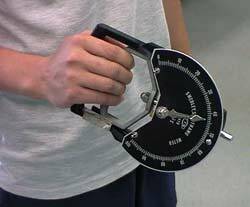 D) Hybrid – This type of testing involves a hand held pressure or tension gauge that is placed in the examiners hand when they are performing manual muscle strength testing. These devices generally fall in between manual muscle strength testing and gauges in terms of speed, ease of use, accuracy and number of muscles that can be tested. Equipment costs vary but frequently will be close to the total cost of buying multiple gauges. 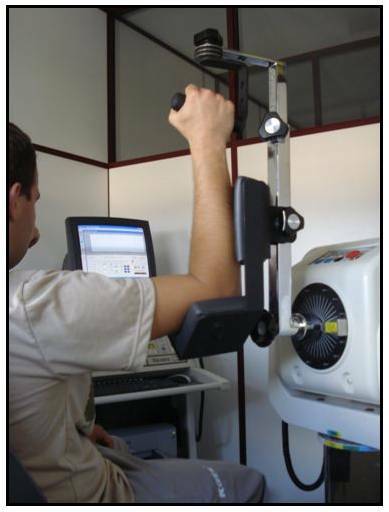 The slight decrease in the number of muscles that can be tested compared to manual muscle strength testing because you cannot fit the device into some spaces like the smaller joints of the fingers and toes or test muscles that require compound motion vectors. The more detailed information you gather on individual muscle strength, the more specific you can get with exercises to correct health issues or improve performance. Which type of muscle strength testing do you use? Next Next post: Muscle imbalances? Even pros have them!